I'm more than a little excited about this: Uncharted 3 comes out tomorrow, and I just got e-mail confirmation from Amazon that my pre-order copy shipped earlier today. If you haven't played a game in the Uncharted franchise before, you're missing out. I'm not a hard-core gamer (I hadn't owned a console for almost 20 years until I got a PS3 for Christmas a couple years ago), and Uncharted 2 remains the only modern game I've played from beginning to end. Uncharted 2 is an incredible game - I picked it back up this past week while my Dad was in town, and my Dad (even less of a gamer than I am!) made it through 1/3 of the game over the course of his visit - and loved it. (Side note: playing video games with your Dad late into the night the same week you turn 40 is about as cool as it gets.) It's funny, thrilling, and at times surprising - and easy for a newbie like me to pick up and still feel engaged. As I said to my Dad - Uncharted - not Indiana Jones - is the franchise Steven Spielberg would build today if he were 22 years old. 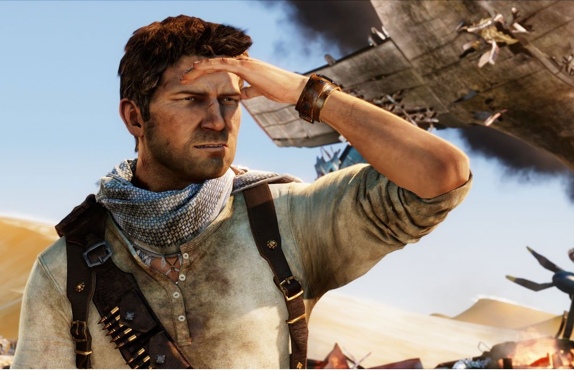 And after playing Uncharted, it's not hard to understand how the video game industry is bigger than the film industry. I've deliberately avoided watching any of the game play videos or reading the reviews in depth. All I know is that I'm going to have a lot of fun hanging out with Nate Drake again in the weeks ahead. Debated picking up pre order tonight... need to read though. Tomorrow night the adventure begins again... for a third time! Stoked. I have to ask, is this a series I need to pick up 1 and 2 or can I jump in on #3? I have not been much of a console gamer but this is the third review by people in a similar boat I have read that say it is a must play. @Rob: I started on Uncharted 2 and never felt lost. (Though there was one surprise in the game that was lost on me until I read some of the characters' back stories from 2.) I think you'd be fine jumping into Uncharted 3, and you can read up on any of the reviews of Uncharted 1 or 2 to fill in any gaps you have.